It appears Ash trees, the Fraxinus genus, will be missing from western cities in the next couple of decades. After years of trying to stop the invasive pest, Agrilus planipennis, the emerald ash borer, from crossing state lines, the United States Department of Agriculture is ready to call it quits. The USDA has proposed abandoning its quarantine of the insect, which currently restricts movement of ash tree firewood. Rather than controlling the human directed movement of the invasive pest, the USDA will invest its resources into biological controls. 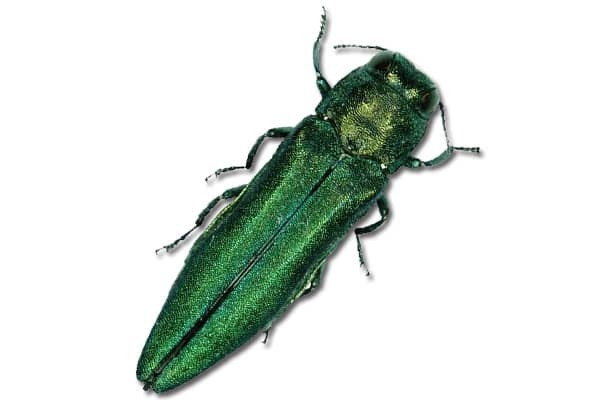 USDA’s Animal and Plant Health Inspection Service or APHIS has managed emerald ash borer, shortened to EAB, since 2003, a year after it was detected in Canton, Michigan. Experts believe the invasive insect was brought to the United States in the mid-1990s. The pests transport was likely facilitated by shipment of wooden crates and pallets over the Atlantic Ocean. EAB is one of the most destructive insect pests in north America, killing an estimated tens of millions of healthy ash trees since its introduction, accounting for tens of billions of dollars. Since its discovery, the insect has spread to 33 states and every year the insect continues to be detected further away from quarantines. The biggest culprit in pest movement is the transport of firewood. Uninformed campers move infected firewood across state lines all to commonly. Even without campers, though, the beetle itself advances several miles every year. The consensus among experts: eradication of EAB is not possible. Pest avoidance, impact minimization and reduction in damages are achievable. The ruling by APHIS to reroute funding from quarantines to biological controls will likely be official by July, which then requires a 60 days public comment period. 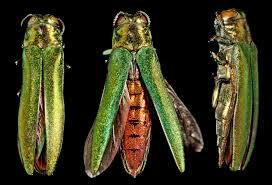 Agrilus planipennis is a metallic green jewel beetle or buprestid that feeds on ash trees. Its native habitat is northeastern Asia, eastern Russia, Japan and Korea. The insect is roughly 1/3 of an inch long and a tenth of an inch wide. Interestingly, the Agrilus genus has the largest number of species of any single genus in the animal kingdom, with around 3,000 species known world-wide. Use that fact next time you’re looking to impress someone. EAB is the only species of Agrilus in north America with a bright red under abdomen when it’s hardened exterior wings (elytra) are open. Ash trees in Asia and Russia co-exist with EAB. This coexistence offers hope for American ash trees in the form of species hybridization and American/Asian species crossing. This is not the first time an invasive pest devastated north American trees due to shipping crates being transported overseas. In the late 1800’s and early 1900’s, American chestnut (Castanea dentata) trees began dying, nearly going extinct in years to come. Chryphonectria parasitica or the chestnut blight was what devastated American chestnut forests. Since the 1980’s, scientists have successfully hybridized Asiatic and American chestnuts to create disease resistant species plantable here in the U.S. Treatment of EAB is possible through correct identification of the pest, early detection and Plant Health Care treatments.